In an ominous sign, the U.S. Air Force is preparing to put their nuclear bomber fleet on 24-hr alert status for the first time since the Cold War ended. 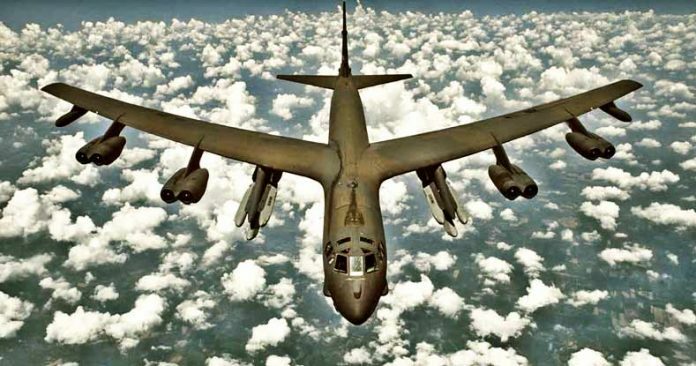 Washington, DC – With tensions continually escalating on the Korean peninsula, the U.S. Air Force is reportedly preparing to put its fleet of nuclear-armed B-52 bombers on 24-hour ready alert for the first time since the end of the Cold War in 1991. Defense officials reportedly denied to Fox News that bombers were ordered to go on 24-hour alert, but Gen. David Goldfein, who is the Air Force’s top officer and member of the Joint Chiefs of Staff, told Defense One preparations are underway. So, although the alert order for 24-hour ready status had not yet been given, plans are currently underway to operationalize the order when it comes. “Goldfein and other senior defense officials stressed that the alert order had not been given, but that preparations were under way in anticipation that it might come. That decision would be made by Gen. John Hyten, the commander of U.S. Strategic Command, or Gen. Lori Robinson, the head of U.S. Northern Command. STRATCOM is in charge of the military’s nuclear forces and NORTHCOM is in charge of defending North America. Gen. Goldfein noted that by the U.S. Air Force positioning its fleet of B-52 nuclear bombers on 24-hour alert, the Air Force is preparing “for the reality of the global situation we find ourselves in. “It’s no longer a bipolar world where it’s just us and the Soviet Union. We’ve got other players out there who have nuclear capability. It’s never been more important to make sure that we get this mission right,” Goldfein added. Pundits were initially at a loss to understand how there was a sudden shortage of pilots, but given the reported change in readiness posture of the Air Force’s B-52 nuclear bomber fleet, the move now seems to be explained. “Inside, beds are being installed for more than 100 crew members, more than enough room for the crews that would man bombers positioned on the nine alert pads outside. There’s a recreation room, with a pool table, TVs and a shuffleboard table. Large paintings of the patches for each squadron at Barksdale adorn the walls of a large stairway. The B-52 can fly to about 50,000 feet at subsonic speeds and has the ability to release a variety of ordnance, including cluster bombs, gravity bombs, and precision-guided missiles—both conventional and nuclear. The 24-hour alert status for B-52s ended in 1991, as the Cold War wound to a close with the fall of the Soviet Union. If these events are any indication, the world is on the brink of potential devastation, unlike anything we’ve seen in the past 26 years. As tensions increase with North Korea, China and Russia, make no mistake that being poised to strike at a moment’s notice only emboldens a security dilemma whereby competitor states will, in turn, put their own militaries on increased readiness to strike. What often ensues is a vicious feedback loop that has the potential to quickly devolve into open warfare. The ominous result is subsequently the creation of a paradigm where one miscalculation could result in a devastating nuclear exchange that would forever change the world. As Neocons March us into Nuclear war…. Please share this story to help others understand the extremely dangerous game of brinksmanship being played!